During a training session today at work, we discussed the lost art of writing letters. I do still write a few letters here and there, but not like I used to. Since Josh and I dated long-distance, we wrote letters on a weekly basis. Sometimes I re-read them and think about how sappy we were. And, then again, we are still sappy. We were just really sappy when we were penning love notes that crossed a thousand miles. I still remember the tingly feeling I got when I noticed his handwriting on the envelope and how I hurried to find a quiet spot to read it. 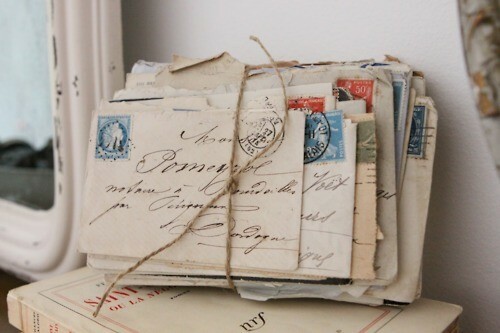 To this day, some of those letters contain some of our most precious thoughts about one another. I wish that I took the time to write more letters. I realize that letters are usually far more intimate and personal than a zipped off e-mail or facebook message. I write about different things. I ask different questions. So, I'm on a mission to write more letters. They don't all have to be long and lengthy, but I do want them to be meaningful and intentional. Come back on Monday for something extra special!